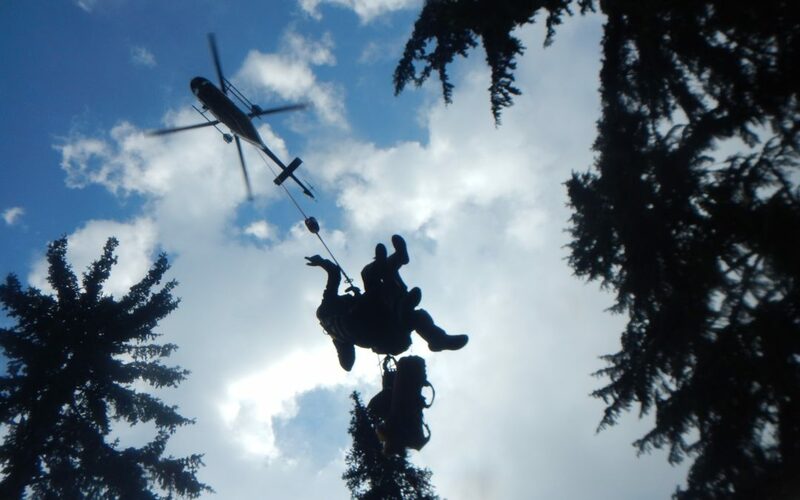 Continuing Campbell River Search and Rescue’s busy summer of calls, our Helicopter Assisted Extraction Team was called into action on the afternoon of Wednesday the 6th. The mission was to locate four experienced kayakers stranded on the Klinaklini River, which flows into Knight Inlet, and transport them to Campbell River. The initial plan was to fly in, lift them from their location with a long-line under the helicopter, and transport them to a safe landing zone. As the afternoon and early evening unfolded, it became apparent the situation was not so simple. The forest canopy in the area restricted visibility, making it difficult to locate the subjects. A significant amount of time was spent searching before they were spotted. With little daylight left and seeing that they were in a safe location, we were forced to return to Campbell River and formulate a plan for Thursday. Low cloud the next day forced our volunteers to standby for the weather to open up enough to fly. Unfortunately, it never did and the four kayakers would be spending another night on their planned 9-day trip in the wilderness. Early Friday morning three SAR members were transported by helicopter to the head of Knight Inlet where they were met by a wall of fog. As the morning progressed, the fog gradually lifted allowing the team to make two more advances up the river. Finally we were able to enter the canyon and make visual contact with the kayakers. By 2 PM our Class-D-Fixed-Line helicopter team was making preparations for the series of lifts required to move all four subjects to an area where the helicopter could land to load everyone inside the aircraft. SAR volunteers Richard Finch and Daryl Beck were on the end of the fixed rope under the helicopter while Tim Strange took the role of spotter from the helicopter. After the long, complex, and successful rescue, the team returned to Campbell River with four very happy paddlers. The lesson for backcountry adventurers is be prepared and don’t overextend your abilities. This group of paddlers was prepared with an InReach communication device which proved its worth over the three days. Into their trip they realized their limitations and made the decision to abandon their kayaks to start their backup plan – hike out. Two days of bushwhacking led them to an impassible tributary on the Klinaklini. They were stuck and wisely chose not to jeopardize the safety of any of the team members. They activated the emergency satellite beacon and the 4 kayakers will be able to buy new kayaks to enjoy future adventures because of clear, safe thinking.